A contemporary Grayish Blue finish accents the elegant detailing and solid poplar construction of the Kelly 24-inch vanity. Kelly's furniture grade styling and generous storage space can be paired with the matching Linen Tower, providing ample practicality and panache to your bathroom space. Add a handsome and sturdy stone top to complete your vanity set. The Newport Collection combines classic design with dazzling mirrored accents, producing a vanity rich in style. Featuring six drawers and a large central storage compartment, the Newport vanity provides plenty of storage space within its 48-inch frame. The French Gray Finish adds a touch of old-world elegance to Newport's transitional lines. You can add a handsome Carrera white marble top and white vitreous china rectangular undermount sink to create a smashing vanity combo. The coordinating mirror completes the look. Acclaim 48-Inch Vanity Cabinet in White Sublimely linking traditional and modern design aesthetics, and part of the exclusive Wyndham Collection Designer Series by Christopher Grubb, the Acclaim Vanity is at home in almost every bathroom decor. This solid oak vanity blends the simple lines of traditional design with modern elements like brushed chrome hardware, resulting in a timeless piece of bathroom furniture. Featuring soft close door hinges and drawer glides, you'll never hear a noisy door again! Available in multiple sizes and finishes. 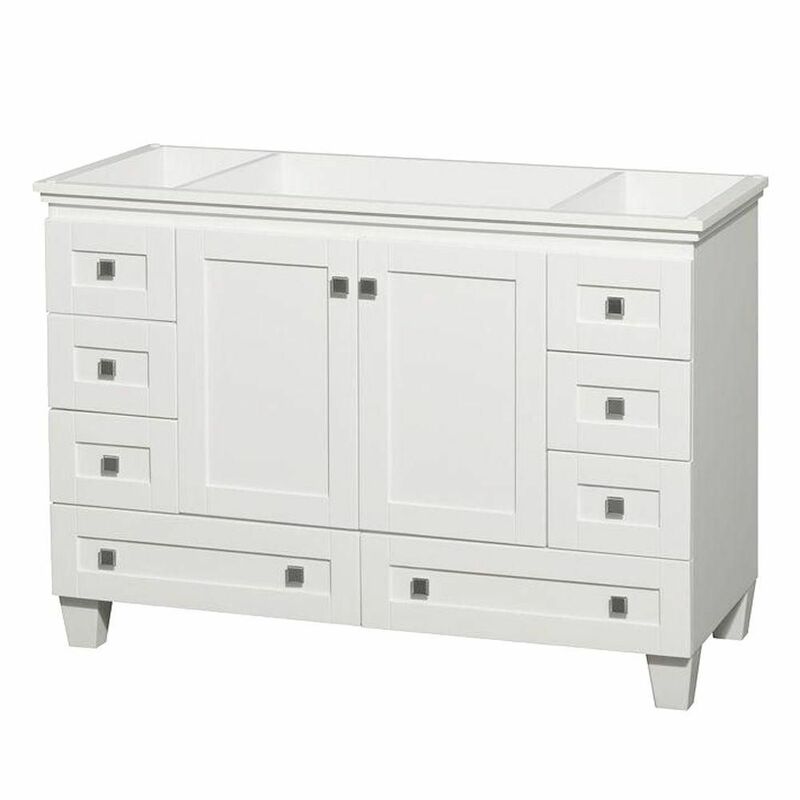 Acclaim 48-Inch Vanity Cabinet in White is rated 4.7 out of 5 by 12. What are the dimensions of the drawers? I'm concerned the drawers on the sides of the unit are rather small.